For the dedicated beer fan, the prospect of sitting nursing an empty glass, ignored by tardy bar staff is the stuff of nightmares. But now a new invention from Mitsubishi Electric aims to put an end to this sorry state of affairs once and for all. 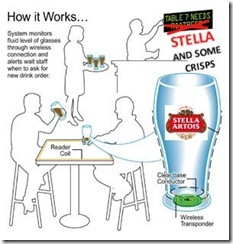 Ladies and gentlemen, may I present the Intelligent Beerglass. This is a genuine invention from Mitsubishi’s research labs – God bless them, one and all! Since restaurants often make much of their profits on drinks, it is critical for servers to offer refills in a timely fashion. We propose wireless liquid level sensing glassware to aid in this task. Specially instrumented glassware detects fluid levels via a high-resolution capacitance measurement. A coil embedded in the table inductively couples power to the glasses, and provides a path for data exchange. Our prototype glass uses a standard microprocessor and a small number of passive components, making it extremely inexpensive. Background & Objective: It is a common problem you are in a bar or restaurant with your drink almost gone and you are desperately hoping that one of the staff will notice and offer you a refill. Sometimes they do, and sometimes they don. If they don’t, you leave a little less happy with your experience and are less likely to return, the waiter or waitress gets a lower tip, and the restaurant has lost the chance to sell you a drink. Meanwhile, thirsty customers may stand waiting at the door for lack of a table. Everyone loses. It is such a little thing; yet doing it right or wrong can easily make the difference between economic success or failure. By using a combination of RFID and capacitance sensing technologies, we are able to achieve these properties. Now it has often been noted that your humble scribe is no slouch w hen it comes to innovation. And during the course of writing this blog, a couple of modifications to the proposed system came to mind. I wonder if I should contact the patent office now?